Product #15579 | SKU DTP 340 REX | 0.0 (no ratings yet) Thanks for your rating! The ambitious Lewitt DTP 340 REX developed for entry-level use, make the hearts of beat aficionados beat faster. Thanks to its cardioid polar pattern and customized frequency response, the dynamic DTP 340 REX offers everything you need to mic bass instruments: catchy, impressive sound and reliable performance on stage and in the studio. Since 2012, the DTP 340 REX offers another innovative feature. 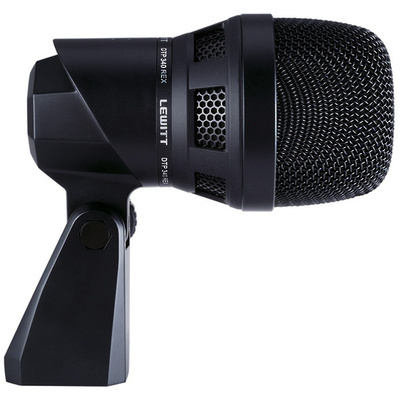 In addition to the accustomed neutral and pure sound – developed for maximum application diversity –, the ‘Enhanced Frequency Response’ switchable right on the microphone will deliver an unbeatably impressive sound by emphasizing frequencies from 70-150 Hz and 3-5 kHz – especially optimized for use on kick drums.